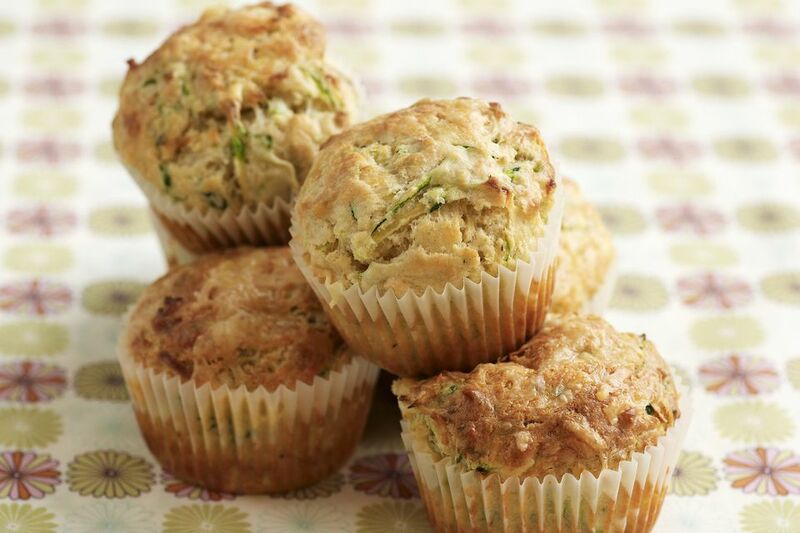 These moist and delicious zucchini muffins made with shredded carrots put a nice spin on the classic recipe and make a wonderful breakfast sweet bread or snack served with flavored butter or a simple cream cheese spread. Zucchini is a squash that plays well with other foods so if carrots aren't your thing, other good zucchini muffins or bread recipes include oranges and fresh or dried cranberries, chocolate and pecans, and walnuts and dates. Heat oven to 375 F. Grease and flour 12 muffin cups and set aside. Make the cinnamon sugar by combining 1/2 cup white sugar with 2 tablespoons cinnamon and set aside. In a large mixing bowl, beat the oil with eggs, white sugar, brown sugar, and vanilla extract until well combined. In a separate medium bowl, whisk together the flour, baking soda, baking powder, salt, and cinnamon. Add dry ingredients to the wet ingredients, stirring until no streaks of flour remain, but do not overmix. Fold in the shredded zucchini and carrots until completely incorporated. Fill muffin cups about 3/4 full; sprinkle with cinnamon sugar or granulated sugar, if desired. Store any extra cinnamon sugar in a covered container at room temperature indefinitely. Bake muffins for 20 minutes or until a toothpick inserted in the center comes out clean. Remove from oven, wait 5 minutes before turning out onto a wire rack to cool slightly before serving with butter or a spread. Store completely cooled muffins in a covered container in the refrigerator for up to one week, or freeze them in a freezer bag for up to 6 months. To turn this recipe into a loaf of zucchini-carrot quick bread, place the rack in the middle of the oven and heat it to 325 F. Turn the batter into a greased and floured 8 1/2-inch by 4 1/2-inch loaf pan and bake for 45 to 60 minutes or until a toothpick tests clean or with just a few crumbs attached. If the loaf is browning too fast, cover loosely with foil. To take the moisture to another level, add 1/2 cup raisins or craisins to the batter. Add 1/2 cup of flaked sweetened coconut and/or chopped walnuts or pecans to the batter along with the shredded carrot, or omit the shredded carrot entirely. A pat of butter on a still-warm muffin is a great way to go, but if you like to gild the lily, a flavored spread puts it over the top. Pineapple Cream Cheese Spread: Combine 8 ounces of softened cream cheese with 1 (8-ounce) can be drained, crushed pineapple. Cinnamon Cream Cheese Spread: Beat together 4 ounces of softened cream cheese with 2 tablespoons of packed light-brown sugar and 1/2 teaspoon of ground cinnamon until smooth and well blended.